In late November 1985 I became the proud new mother of my second child, a sweet baby boy. Needless to say, Christmas shopping had already been done to the best of my hugely pregnant ability. But the one thing I never managed to pick up that holiday season was the very important Hallmark Baby's First Christmas ornament for the family tree. A couple of family friends sent gifts with little ornaments attached, but the main Hallmark ornament just never got purchased. Fast forward to 2010. The aforementioned baby is now almost 25 years old and well on the road of his life. But every year when I decorate my Christmas tree, complete with the Baby's First Christmas ornaments of his older sister, born in 1983, I feel just a little pang of regret that one little detail got overlooked that year. Well, my internet surfing skills continue to improve little by little. I now even can add Ebay to my repertoire of online shopping haunts. And I can even proudly boast that I sometimes have some killer bidding skills when the item of my desire appears on my screen. This afternoon I jumped on Ebay to look around and decided to search for that elusive baby ornament. As if by divine intervention, there it was at the very top of the computer screen. 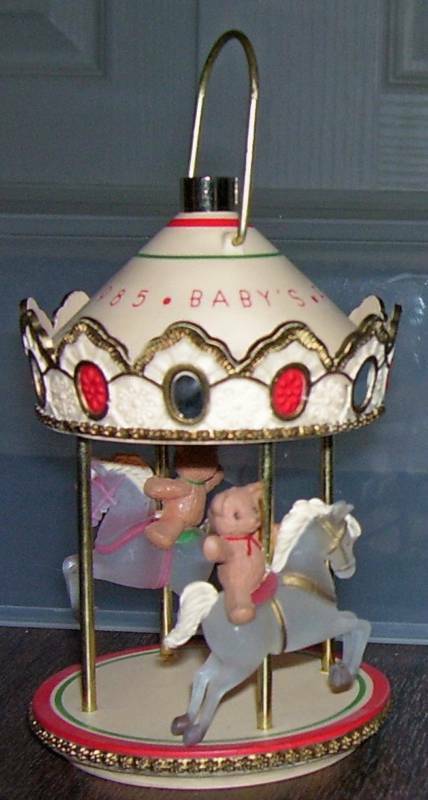 A vintage 1985 Hallmark Baby's First Christmas Carousel lighted ornament. No box, but hey, no biggie to me. NINE minutes left in the auction. I think I hyperventilated a little. I quickly logged in and the bidding war was on! First bid, "you have been outbid, please try again". Second bid,same bad news. Next bid, "you are the highest bidder!". Okay, now the gloves are off. It has to be mine. A young mother's regret has to be avenged. One more click; the countdown begins. One minute and counting down. "You won this auction." I felt victorious and silly all at the same time. But I'll tell you one thing, when I hang that little carousel on my tree this Christmas, I will revisit the joy I felt twenty five years ago rocking that baby boy in my arms. * Such a heartwarming story of your "triumph"!!! Even tho we never had the blessings of children, I can IMAGINE how you feel~~~ SOOO, this makes me smile & feel SOOO good for you! Thanks Linda! Warm wishes to you as well! You are so kind. I totally love this post!! I could write a book on why, but I won't just know I understand how you feel!! God Bless You!! Yes to the fact that e-bay can be awesome!! Carol Raley Interiors in At Home Tennessee!